Kenneth Olin Maynard (1895-1973) was an American motion picture stuntman and actor. He appeared in more than 90 films over 20 years with his white cowboy hat, fancy shirt, and a pair of six-shooters. He first appeared in silent motion pictures in 1923 as a stuntman or supporting actor. In 1924 he began working in western features, where his horsemanship and rugged good looks made him a cowboy star. Maynard's silent features showcased his daredevil riding, photographed fairly close so audiences could see that Maynard was doing his own stunts with his white stallion "Tarzan." 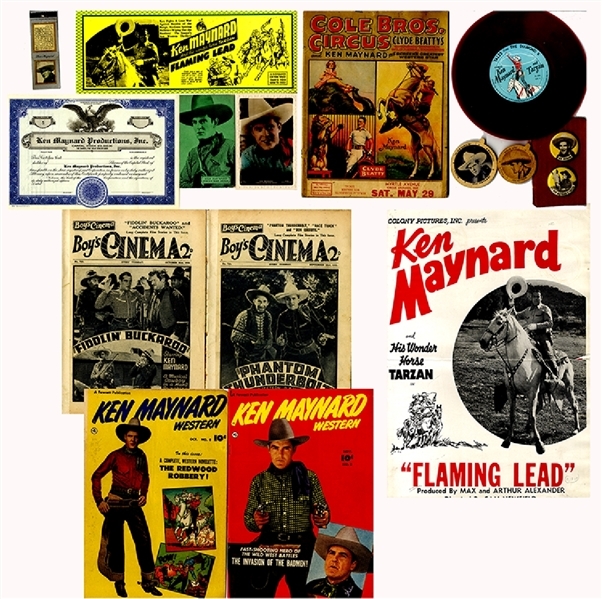 The group consists of a 78rpm “Tales From Diamond, starring Ken Maynard and Tarzan; 8-1/2” x 11”, color card with bio onfo on the reverse; Program for Cole Brothers Circus with Ken Maynard featured on the cover; Advertising card, 12” x 5” for Ken Maynard in Flaming Lead; Another advertising piece for Flaming Lead, 8pg booklet, 12” x 18” with Maynard featured throughout: (3) Comic Book issues of “Ken Maynard Western”, c1950, color covers of Maynard; (3) Boys Cinema Magazines, 1933, promoting the Maynard Films; Blank Stock certificate for “Ken Maynard Productions; (6) color printed cards, 6” x 3” from the Ken Maynard Personal Appearance Tour; (2) Color printed Maynard Post Cards; (2) printed Dixie Ice Cream caps, each advertising a Maynard film; (2) Maynard pibacks advertising a film.